It's not all about cider in the south west as it shoots from the hip in the battle of the digital clusters. As MT likes to harp on, you don’t have to stay in London to find examples of thriving tech communities in Britain. And one of the fastest growing of these in recent years has been Bristol & Bath. These cities are better known for their Georgian architecture and cider than digital startups but the numbers show this cluster means business. 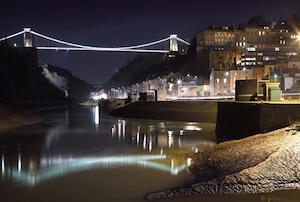 Figures from McKinsey and Centre for Cities show that the south west’s technology industry employed 69,000 people in 2012, up from 62,000 three years earlier, and contributes £4.8bn to the economy. The same report identified the south west as the UK's fastest-growing 'globally significant' tech cluster outside London. This cluster map from Tech Spark can give you some idea of the scale of the region's high-tech industry, which is fed by the cities' top notch universities. This week, Invest Bristol & Bath, the government funded development agency, announced it had attracted 1,200 jobs to the region since it launched last year. Matthew Cross, its inward investment director, said that while London could be a good starting point for international businesses, the west is where they can go to grow. The brain drain effect of London, which is sucking in skilled talent from across the country, is a massive challenge for graduate and technical employers, which have to fight to prevent their staff succumbing to the pull of the capital. The most successful clusters like Cambridge, where Amazon is hiring staff to work on its delivery drones and Apple is rumoured to be opening an R&D office, and Bristol/Bath benefit from having enough employers that workers won't feel tied down to a career with one company. A recent feather for Bristol's cap is the decision by the online takeaway platform Just Eat to open an office in Bristol, which expects to employ 100 people by the end of next year. ‘The pool of excellent engineering talent in Bristol, Bath and the South West provides us with an ideal base to build on this success and drive the next wave of invention and innovation for our customers around the world,’ its CTO Carlos Morgado said at the time. Other tech companies in the area include home-grown video marketing startup Coull, which raised $4m (£2.55m) earlier this year (and whose founder Irfon Watkins told MT he was once rugby tackled to the ground by Phil Lynott, the late lead singer of Thin Lizzy. Internet Movie Database (IMDb) was founded by local Col Needham, who still runs it despite selling to Amazon in 1998. HP, Oxford Instruments and Toshiba all have R&D labs there. London has been getting most of the plaudits for digital innovation recently, but Cross is pleased that the Government is taking regional development in tech seriously with the recent launch of TechNorth, an agency tasked with emulating the brand recognition of east London's Tech City. The region is clearly booming, but as London continues to draw in the country's talent and the world's money, the extent to which it can maintain its onward march remains to be seen.